Most companies are primarily concerned with price when it comes to beverage and liquid product packaging, but what if designers were given free reign to tweak the standard designs so they’re more user-friendly? These 14 packaging design concepts solve annoyances like caps that are difficult to open, bottle shapes that force you to crane your neck to drink and the frustrating inability to reach those last drops of product in the bottom of a soap bottle. 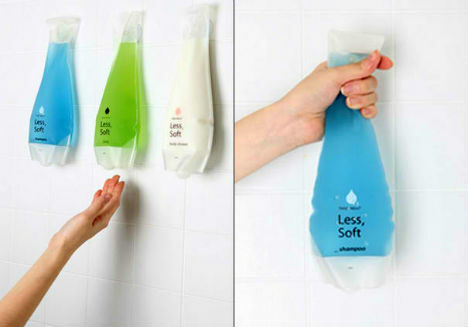 Soft bottles with suction cups to attach them to the shower walls eliminate all the clutter that various toiletries can create in the bathroom. These bottles are made from cornstarch vinyl, so they’re easy to squeeze, and making them transparent may help distinguish between different types of products stored inside. 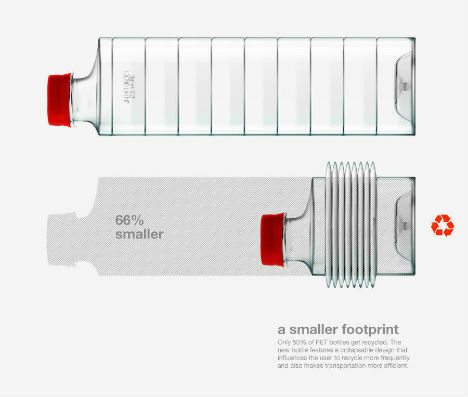 This simple change in the standard water bottle design seems so obvious, it’s amazing that it hasn’t been implemented already. Moving the mouth of the bottle from the top to a 45-degree angle makes it much easier to drink and re-fill. No more craning your neck to get those last drops. 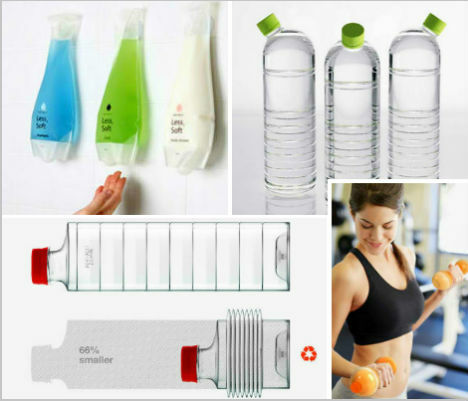 Since you’re probably carrying a water bottle or sports drink while working out anyway, why not make it do more? 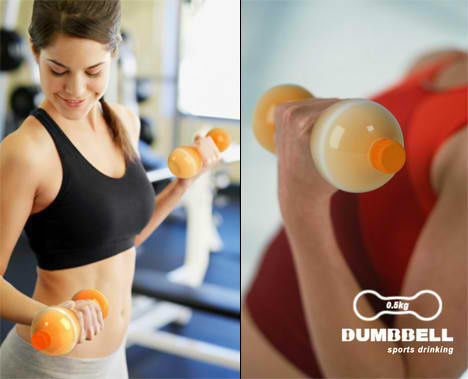 The Dumbbell sports drink bottle won’t exactly get you ripped at just .5kg (1.1 pounds), but you could always fill it with something heavier when the drink is gone. Sometimes you’re caught without a bottle opener, and using your teeth isn’t exactly a good idea unless you’re willing to part with them. What if bottle caps had little easy-pull tabs on them? 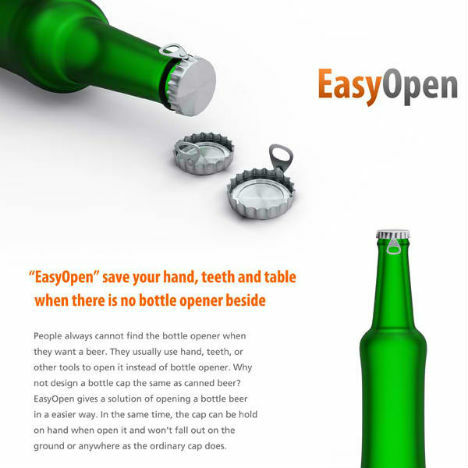 The ‘EasyOpen’ concept would certainly do what the name suggests. 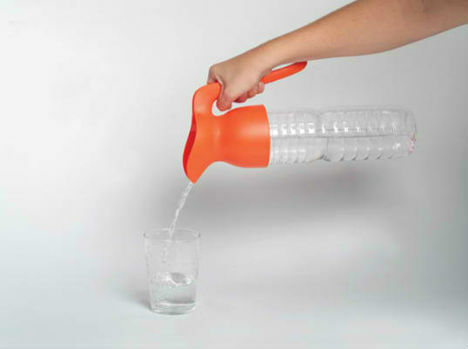 The Aqua Jar by GH Lab extends the life of a plastic bottle by turning it into an easy-pour pitcher. 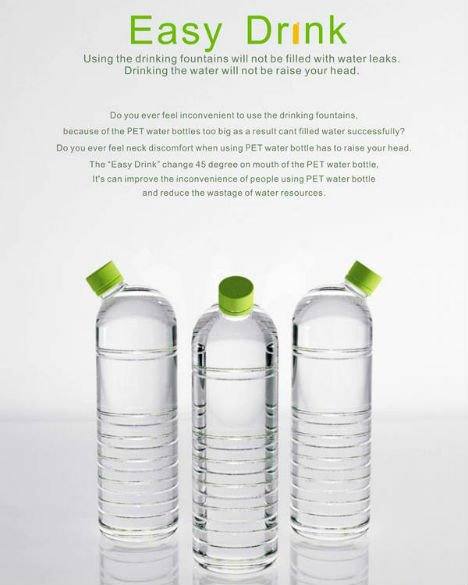 It’s made from biodegradable and recyclable plastic, and fits the universal coil of any plastic bottle. 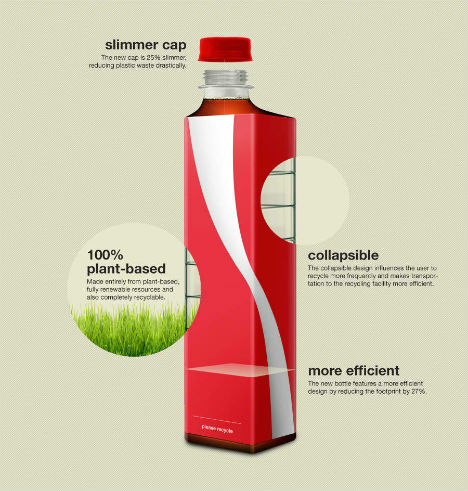 “Same classic design, just greener,” says Andrew Kim, designer of the Eco Coke bottle. So what makes it different – and superior – to the current bottle design? Aside from being 100% plant-based, this bottle is also collapsible, making it easier to keep it on hand until a recycling bin is nearby. Since it has a smaller footprint, space for nearly two additional bottles is recovered within standard boxes. While some people will reuse plastic bottles a few times, they’re awkward to clean, and can leach chemicals into the water over time. Glass is safer – and nicer-looking. 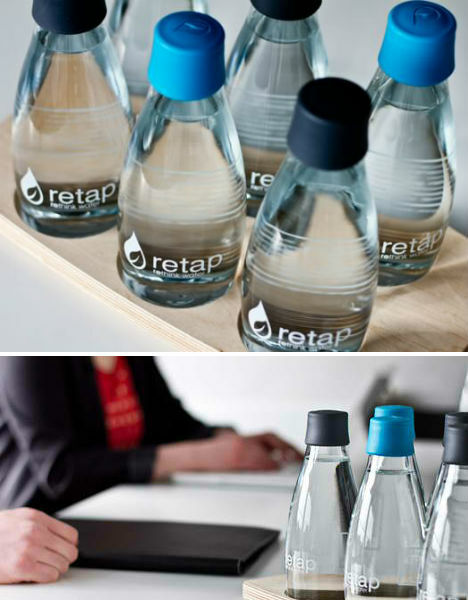 Retap is a designer water bottle concept that’s easily refillable, without any sharp corners to make cleaning difficult.